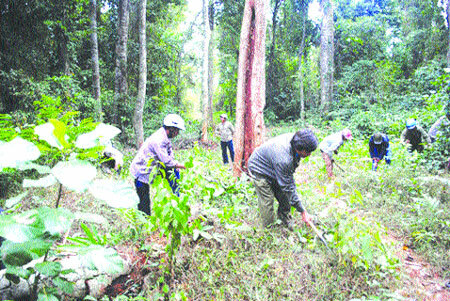 Residents of Groi Village in the Central Highlands have become forest protectors instead of exploiters after they were given tangible incentives for engaging in afforestation activities, Van Thong reports. During our spring trip to Groi Village in the K'Bang District of Gia Lai Province in Tay Nguyen (the Central Highlands); we observed many positive changes in the village. But what made us the happiest was locals' increased awareness about protecting forests. We followed village chief Dinh Loc, an ethnic Bahnar man, on a visit to a natural forest located more than five kilometres away from the village. We met dozens of young people, who were cutting down brushwood and liana, to create a spacious environment for the bigger trees to grow. The village also assembles groups for patrolling the forests, which is aimed at timely prevention of any violations of forest law, such as illegal logging and hunting wild animals, as well as averting forest fires. The voices and laughter of those involved in the forest's protection help dispel the many hardships they face and create a warm and cheerful atmosphere. Loc pointed at a big tree, approximately more than a century old, which was more than one metre in diameter and 15m in height. He told us that this precious tree had almost been cut down by poachers once. "The tree was sawed off till about a fourth of its trunk, but our patrolling team detected it and promptly stopped these violators. "Not only this tree, but some others were also being cut down when we discovered the interlopers, but the villagers were able to take timely action," said the village chief. Groi Village currently has only 61 households, with 374 Bahnar people, who have been living here for a long time. Their lives are stable and depend on afforestation activities, along with crop and livestock farming. Villagers are assigned by the MTV Ka Nat Company to manage and protect 650ha of forest. They are paid VND250,000 (US$11) for caring for each hectare of land, which is thrice as much as they were paid earlier. In addition, the villagers are entitled to actively exploit and use forest products, such as fruits, and different kinds of rattan. The entire forest is assigned to the village community for management under the administration of the village elders' council. Based on the actual number of family members and ability of each household, the village elders allocate a reasonable portion on average for monitoring, with each household being assigned up to 10ha of land. "Forest management and protection is administrated by the village elders' council directly. We receive technical guidelines from the company's staff. Income from forest management is decided by the village council. Particularly, rattan products are retained as the village's property and used for renovating houses and making baskets," village chief Loc said. The villagers have been divided into 13 working groups, each having four to five persons. During the season for caring the forest, the village mobilises all these groups, and during the off-season, the village assigns one or two groups to patrol and guard the forests. When someone detects illegal loggers, he or she uses a mobile phone to contact others and all of them gather at the spot to prevent the loggers, or call the relevant authorities to intervene. Dinh H'Lem, the head of these forest protectors, said: "The villagers are very enthusiastic and self-disciplined about protecting the forest, because the forest has become a source of revenue and contributed to improving their lives. All members in the groups are highly aware of the task, they are ready to go and always do a good job." "If a household cannot protect their allotment well or let a violation occur, the village council would hand over that area to another household for management," he added. Not only Groi Village, but all 11 villages in the region that have the forests under the management of the Ka Nat Company, carry out their forest protection duties effectively. The company currently manages 8,000ha of natural forest. It has already allocated 2,900ha to the villages, with 524 households participating in their protection. The remaining more than 5,000ha of forest cover is managed by the company itself in collaboration with the state rangers. 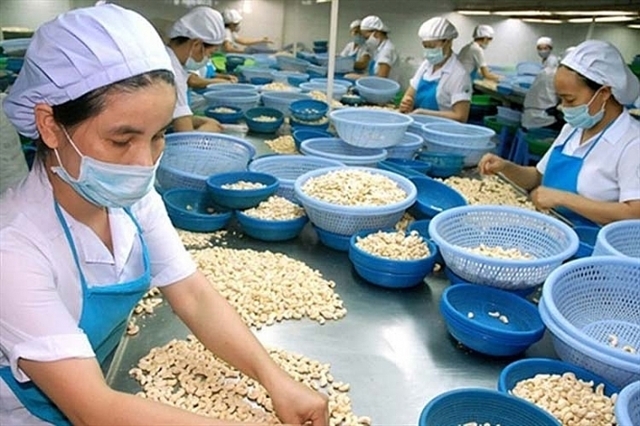 The company's President and Director, Nong Van Tuong, said: "Thanks to the new management policy and mechanism, the benefits villagers draw from the forest are much higher than before, so they are happy and voluntarily join forest protection."